Sally Swift was born in 1913 and grew up just South of Boston. 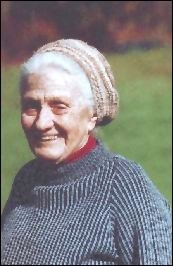 Sally was the founder of Centered Riding Inc and sadly passed away on April 2nd 2009 due to pneumonia and complications just weeks before her 96th birthday. At the tender age of 7 years old Sally was diagnosed with a spinal scoliosis and she wore a back brace in the years that followed. This led to her eventual development of Centered Riding even though Centered Riding was very much a second career for her which started upon her retirement from the American Holstein Association. After graduating high school Sally went on to study with Phylis Linnington in England and Colonel Guirey of the Botts and Saddle Riding School in New York City and also taught at various riding schools over the years that followed. It was during her twenties when Sally began to explore the use of Alexander Technique and Feldenkrais in riding. This was following working with Mable Todd who encouraged Sally to explore new awareness in movement. It was through the use of Alexander and Feldenkrais that Sally was finally able to discard the back brace that she had worn for years. Sally launched her first book in 1985, Centered Riding which was refered to as 'The book which revolutionised Riding'. 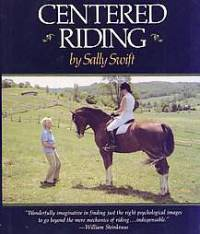 Centered Riding is now a classic and was published in 15 languages, it has sold over 800,000 copies worldwide and led to Sally publishing the second book, Centered Riding 2 - Further Exploration in 2002 and this book is following in it's predecessor's footsteps with nine foreign language editions. Sally also produced 2 Centered Riding Videos. Despite Sally's fame, knowledge and achievements she never elevated herself above others, she greeted all who journeyed down her path with warmth and humbleness and she could relate to anyone, young or old. Sally was a natural teacher and those who came to know her through Centered Riding felt as though they has lost a very dear friend when she passed away. Centered Riding is a gift that Sally Swift left for the equestrian world and those involved with Centered Riding worldwide strive to continue it's growth in her memory.